Make a cool smoke effect when you are using the hand brake! Click behind the rear tires with the Thruster tool to spawn one grey cube behind the left rear tire and one behind the right rear tire. 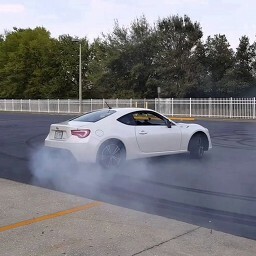 Now each time that you use the e-brakes, the rear tires will produce smoke! Have some advice, techniques or tips to share about Make realistic cars? What do you think of make smoke when using hand brake (+sound)?